I have a for a developer unusual confession to make: I don’t like math. As a tool, great, but as a thing, no. One thing that really infuriates me is than when you want something simple (like intersecting lines and rectangles) all you get is formulas. Even on StackOverflow. I want code. So whenever I translate something from formulas or another computer language, I take care to ‘give back’ the resulting code to prevent other people needing to do the same. 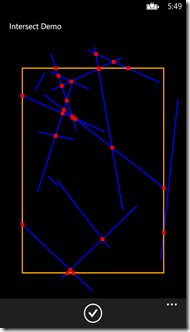 So when I needed a few lines of code to check if lines intersected with each other or with a rectangle – as I need to know when the ball moves over the screen of my Windows Phone app 2 Phone Pong, I was presented with the usual bunch of mathematical formulas… and finally some C code. 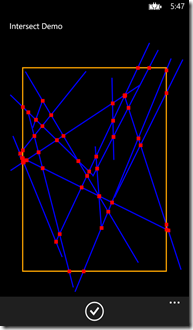 Which I translated back to C#, so now every sod (like me) can check if a lines intersect with lines, or with a rectangle. /* Compute r3 and r4. * same side of line 1, the line segments do not intersect. 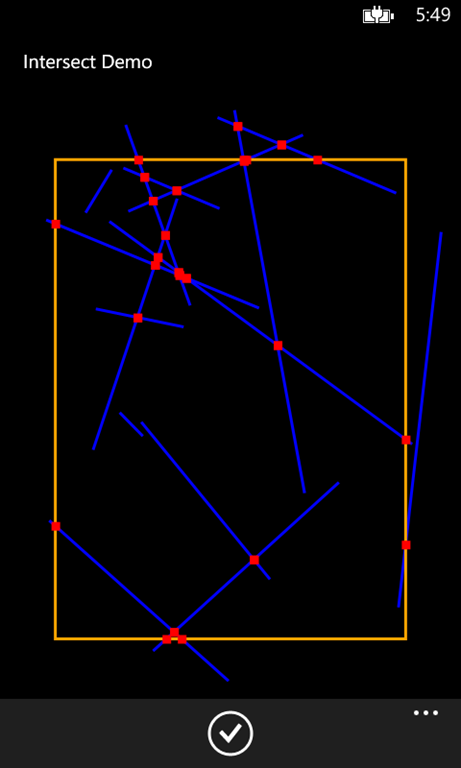 /* Line segments intersect: compute intersection point. * sign of the numerator. 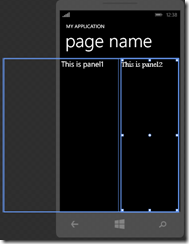 Now because I needed to be able to find intersections with rectangles as well, I made some extension methods that work on the RectangleF class that is in my wp7nl library on codeplex. /// If dx =1 , dy = ?? This I actually wrote myself, and what is simply does is break the rectangle into four lines and tries to find intersections with each of those lines. The result is a list of Point which is either empty or contains points. Visual proof is maybe not the best, but most certainly the most fun. So this is what I use to determine where the ball in 2 Phone Pong needs to bounce – namely when its trajectory intersects with either the screen side or the paddle. This behavior is also a very versatile, in the sense that can be used to move any GUI element from any location to another, but I use it now to make a scroll-into-view panel. 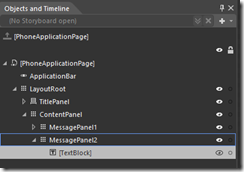 I selected the MessagePanel1 and changed the Colum to 0 and the Columnspan to 2. Set the width to 228 (it is now set to 228 (Auto), fill in a hard coded value). Net result is displayed to the right. 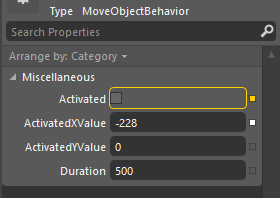 BaseAnimationbehavior has only two properties left that you can set – Duration (the time the effect should take) and “Activate” – a boolean that indicates if the effect should be visible (true) or not. 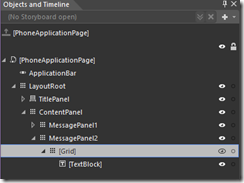 Any descending behavior should implement BuildTransform (to create the Transform for the current state) and BuildStoryBoard (to create a StoryBoard for a transition). The MirrorBehavior introduces two extra properties that you can set: ActivatedXValue and ActivatedYValue. They are both of type “double?” – that is, nullable double. After all, they need not to be set – if you, like me, want to move only in one direction (horizontal, that is) The behavior assumes at startup that wherever the object it attached to is on the screen now, that’s if default location (for Activated = false). So you need only to supply the new values – and it must me relative values. If you want the screen to move to the left, you should provide a negative value. –228, to be precise – exactly the width of the Settings panel. The behavior starts rather simple, as it is rather simple – most of the heavy lifting is done by already published code. 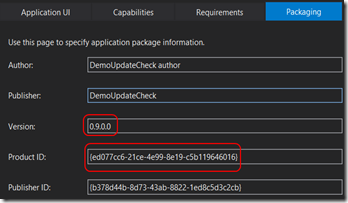 return AssociatedObject.GetCompositeTransform() != null ? 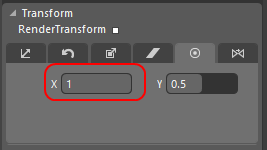 The behavior starts by checking if there’s a transformation defined and tries to get the translation point from that – in other words, is this object already moved from its place using a translation? If not, then assume a translation of 0. TranslateX = Activated && ActivatedXValue != null ? TranslateY = Activated && ActivatedYValue != null ? It sets the X translation to the ActivatedX value if Activated is true and if there is and ActivatedX value defined (it was nullable, remember, so it’s entirely possible it is not – and in all other cases it just uses the original translation value. Repeat for Y. The effect, if I may say so myself in all modesty, is rather charming. 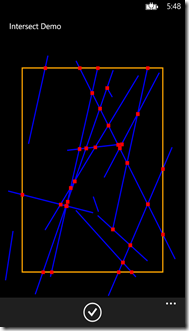 And, by the way, in this little sample solution it’s also ViewModel Driven. And that’s all there is to it. 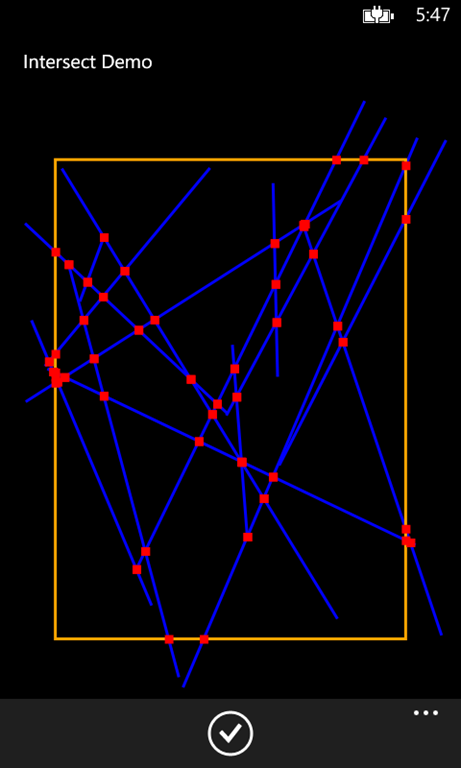 The demo solution contains all code displayed in this sample, including the revised behaviors of my earlier series – but they are not really used in the sample. For the record – I wrote this behavior as part of the 1.1 update of 2 Phone Pong during my holiday, my Surface Pro sitting on the garden table next to our vacation house in Schluchsee in the Schwarzwald (Black Forest), Baden-Wuttenberg, Germany, my wife on next to me reading a book, after a long mountain walk on a beautiful sunny day. While it got slowly dark, we rested from our day’s journey, tea was being consumed, and the typical non-committal carefree talk of a summer holiday evening was going on, this thingy was created. Fond memories. *sigh*. 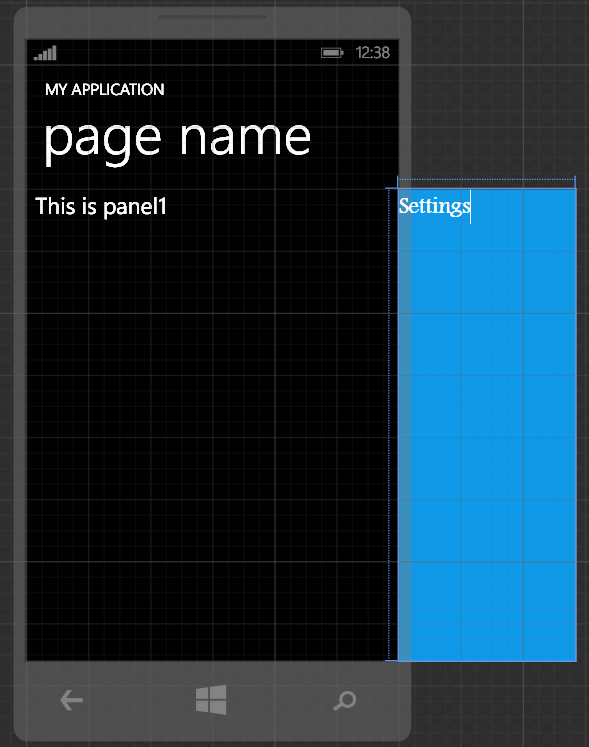 This is a trick I use to make partial screens outside of the actual Windows Phone viewport, for instance like the Facebook app for Windows Phone does – that has these ‘side panels’ that slide into view when you tap the “settings” button. 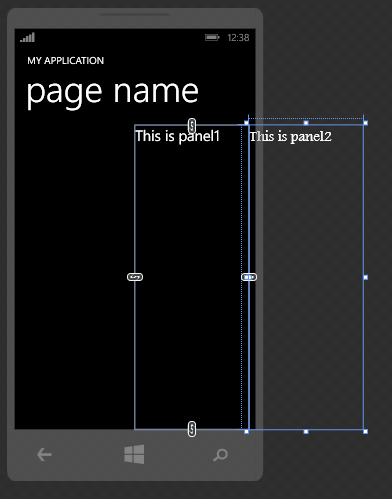 Some people like it, some people hate it for being to iOS-y or to Android-y – I just show you how I do it. This a two part blog post. 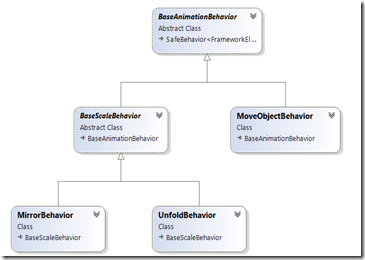 This first one will show you how the XAML trick is being used an why it works – the second one will cover a behavior for animating the screen. 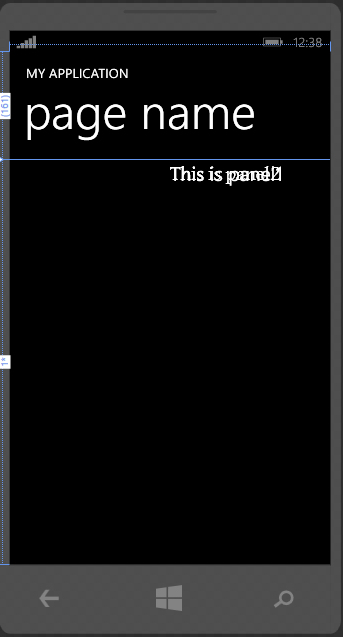 So basically I define a grid that divides my screen vertically in two parts, but both panels are in the same (second column). Now save everything, and open the app in Blend. You will see the following extreme ugly screen as displayed to the right. 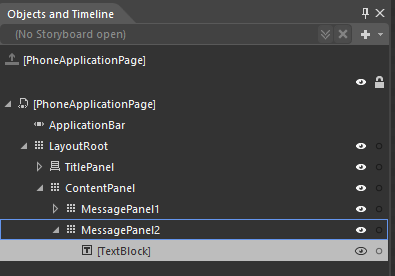 Now go one level up, and select the MessagePanel 2. Click the “Flip X-axis” button again. 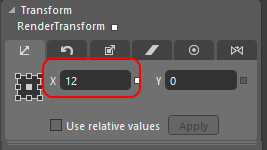 Now if you simply select ContentPanel, click on the Translate X field again and roll down your mouse wheel you will see the the number go below zero and whole screen move to the left, until the whole op panel 2 comes into view (this happens at about –235). Now the only thing we need to do is create an animation that will perform the scrolling. 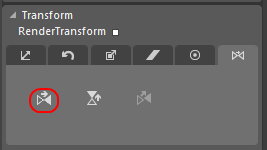 You can do that either in Blend with the Visual State Manager, or with a behavior. I, naturally, choose the latter part. I use both this trick in 2 Phone Pong - not for a settings screen, but to scroll in an advertisement for a more or less secret in-app purchase when the game comes in a certain state (hint – especially when you loose a lot). 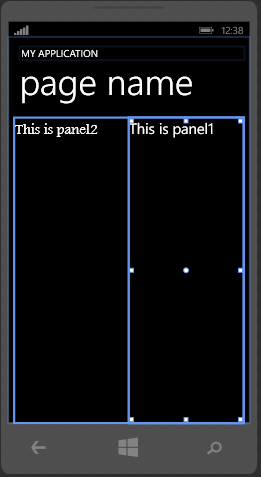 By using this double mirroring (actually scaling to “-1”, as a look in the XAML will tell you) and center point trick, things will always outline automatically. So this was part 1. 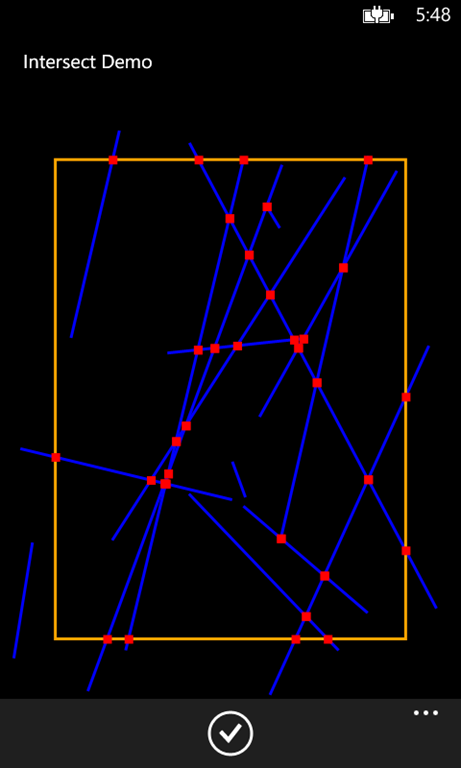 The demo solution, showing the situation above (and not to the right) shows the situation before the screen is translated to the left. Next time I will show you a behavior that can actually be used to simply automate the animation. 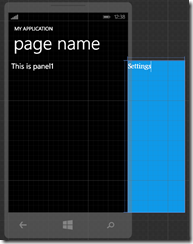 Finally, this trick will work on any XAML platform, not just on Windows Phone. Once again, Blend is your friend. Remember that. If you are fine with that, you are finished. The app will check for updates automatically on app startup. /// A behavior checking from in the app if there's an update available. Since in debug mode the app will run on you phone or emulator using a generated temporary app id, it won’t be possible to check for new versions anyway so I’ve added an #if statement around the actual check. I think my only addition to this is the try-catch around the method as I tended to have some odd errors sometimes when running it inside Visual Studio. This method craftily downloads the app metadata from the store and extracts a version from it. 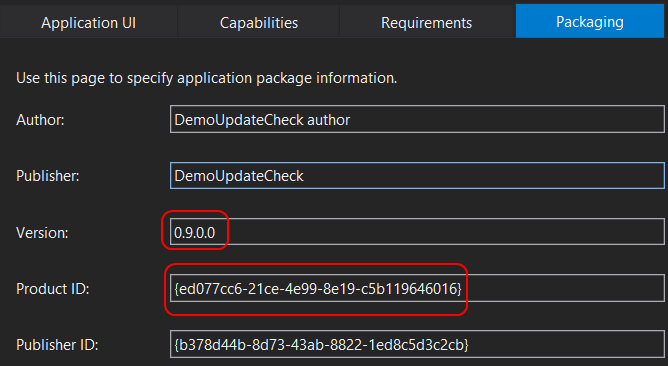 Warning – don’t try to deploy a debug version of your app with this id trick on a phone that has the actual app downloaded from the Store on it. That won’t work – you won’t have writing permissions. I haven’t tried the opposite – downloading an app from the store over an app deployed from Visual Studio – but I can imagine that way only lie mud pies. I don’t think I need to elaborate on how important it is to get ratings for your app in the Store – and preferably good ratings. By no means this is new and original: Matthijs Hoekstra wrote something to this effect, our Dutch DPE Rajen Kishna even made a NuGet package for similar stuff, Telerik have something in their magnificent Radcontrols for Windows Phone and yet me, being stubborn, need to make something of my own. The reason for this is simple: I wanted (of course) to make a behavior so you can add it to your app without any code at all – just drag it on top of your first opening page and it will work out of the box. 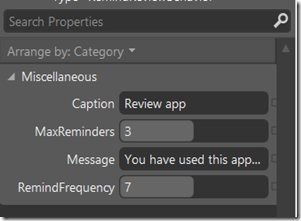 And Blend will present you with some properties that you can set – or not. It works fine out of the box. 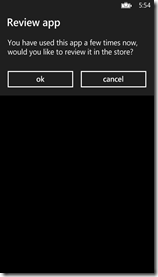 As it does in my latest Windows Phone app, 2 Phone Pong. 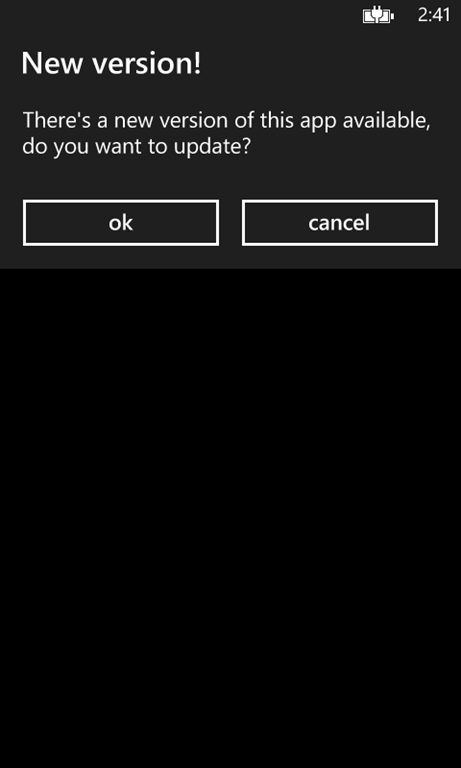 Caption is the text on top of the message box that will display when the app reminds the user. Default is “Review App”. 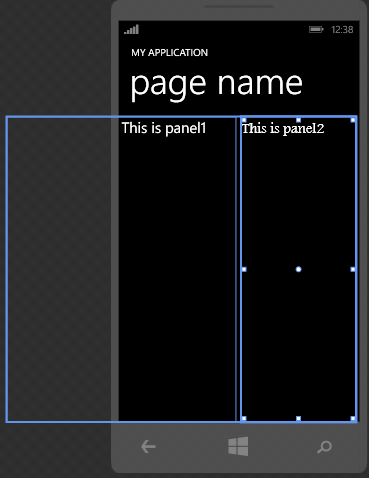 You can set a different value in XAML or (better) bind it to a view model property holding a globalized text. MaxReminders is the number of times the behavior will ask the user to review. If the user refuses to review more than MaxReminders time, he will no longer be bothered. RemindFrequency is the number of app startups after which the review request is displayed. So, with the default setting, the app will ask you the 7th, 14th and 21st time if you want to review the app. After the third dismiss, it won’t ask you anymore. This is to prevent users getting annoyed by endless review requests and giving negative reviews because of that. And of course it will stop asking the user when has elected to post a review. 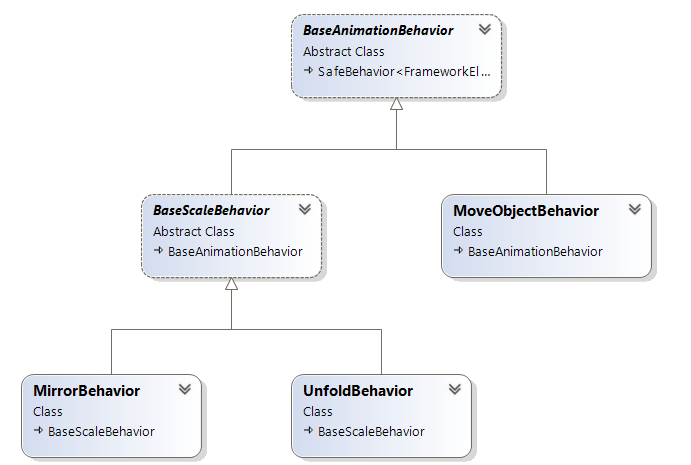 The behavior itself is also pretty simple – it sports four Dependency Properties with the same names as Blend shows – not coincidentally – in front of the text boxes in the image on top of this post. If the user then decides to review the app, the Review method called and the Reviewed property is set to true so the user won’t be bothered anymore. If the user does not want to review, the app checks if the max number of review request has already been put out – and if so, the Refused property is set to true. The user is (also) no longer bothered anymore. And at the end, the remindData is saved so whatever happened in the method is saved for posterity. The only drawback is that the user can click OK, go to the Store, and then hit cancel. There is no way around cheaters, but if someone does not want to review, whatever – at least he/she then won’t give a bad review either. The four dependency properties I leave out for the sake of brevity. 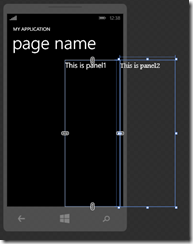 I have put the code into upcoming version of the wp7nl library, but for now you can get it from the demo solution. 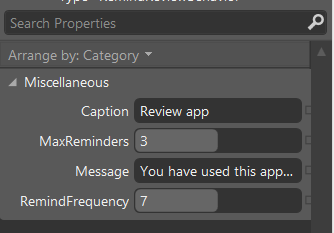 I have changed MaxReminders to 20 and RemindFrequency to 2 so the demo app will ask you every other time to rate it, for 20 times. This is a setting I would definitely not recommend in the wild, but it shows the point. Now Matthijs, Rajen, me and several others have showed you multiple ways to get this done. Mine does not even require you to code – just drag and drop. Now make sure you implement any of these solutions. 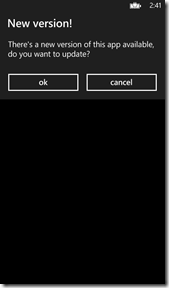 Whether you are in the Windows Phone game for fun, glory, money or all of the above – you want those apps downloaded. And ratings are crucial for that.